The second offering of a five part series. Was de Havilland’s character speaking of the film’s version of John Brown (portrayed by Raymond Massey), or of Adolph Hitler as America watched the rise of Nazi Socialism during the late 1930’s; or was her character speaking of America and its leadership during the current period in our history? 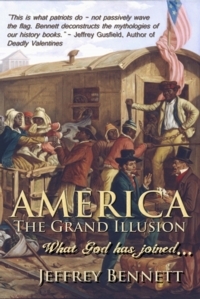 Throughout this experiment, which we call ‘America,’ we continue to witness an intertwining of the stories, which have molded us, both as a people and a country, and through my continued studies, my determination is, that these volumes of books will do much the same thing, therefore the second book in the series, AMERICA: The Grand Illusion will digress back to the early 1770’s, where we already begin to read of the rumblings over the issue of slavery, which nearly a half-century later was coming to a full boil and cause division throughout the land. I awoke this morning to the news that the last surviving member of the John Ford stock company of actors had passed away, Harry Carey, Jr.. ‘Dobe‘ as he was known to his friends; continued to work with John Wayne, and continued on for many years after the Duke was gone. And so now the young red-head goes on to reunite with the likes of the Duke, Ben Johnson, Ward Bond and Old Pappy Ford himself – and maybe even his folks, Harry Sr. and mother Olive. Maybe the U.S. Calvary of Hollywood does meet up again in the hereafter. Have a good journey Dobe. But knowing that didn’t tell me where I wanted to go, as far as a film to watch. Three Godfathers (a Biblical western if there ever was one), The Searchers, She Wore a Yellow Ribbon? No – a western was not what I needed today. Lawrence of Arabia? No – I was not interested in British Imperialism today, nor did I wish to watch, which for me, is one of the most amazing films of our time, Kingdom of Heaven. What is this second volume of our story about? That’s it – Gods and Generals, the 2003 film from Warner Bros.! The bloodiest day of the battle of Fredericksburg has just finished – as it had just days over over 150 years ago, and what moves me the most each time I watch this film, are two scenes; the Irish Brigades of both the North and the South battling for their own ideas of freedom; and ‘Billy Yank‘ and ‘Johnny Reb‘ meeting each other in the midst of the river and sharing a smoke and a cup of coffee. No words are spoken – just a moment of Christmas peace in the middle of a horrible war, – but then all wars are horrible. As in all wars, each side is right and both are wrong. And yet, Lieutenant Colonel Joshua Lawrence Chamberlain (as portrayed by Jeff Daniels in the film) states, “This war didn’t start for the purpose of freeing the slaves, but that is what it has become.” Tell that to the historians of today, and they will disagree with you until the next war begins. Yes, much of this volume covers the issue of slavery – an issue, which we are still discussing in the twenty-first century – not in some distant land – but right here in America. Once again, the lessons of the past are our road map to the future. Take heed. In addition to the issue of slavery, which America tolerated in its early years, we’ll look at the letters, speeches and papers (some of which are rarely seen or read – and certainly no longer taught in the nations Government controlled “education system”), but we’ll share a time in history, where this nation was experiencing its second birth, or as film director, D.W. Griffith called it, “The Birth of a Nation.” If during the War of Independence eighty-five years earlier, we were a “nation conceived in liberty,” then the second time around, we were conceived in BLOOD! What does our future hold? Look around the world; Egypt, Greece, Spain, Israel and Palestine, and America’s continued involvement in places like Iraq and Afghanistan, and many other “theater’s” around the world. The winds of revolution are blowing, and I fear that we cannot escape this global epidemic. What we share with you in AMERICA: The Grand Illusion – What God has joined… will expand on the good, the bad and the ugly of our ever evolving experiment. If during the War of Independence eighty-five years earlier, we were a “nation conceived in liberty,” then we as a people had not learned the lessons of freedom. You’ll discover slavery through the eyes of Washington, Jefferson, Hopkins, Pinkney and others of the Colonial era, and how 85 years later, the Nation erupted in BLOOD. With this volume we learn of a rising awareness of slavery and it’s part in the American Civil War (The War of Northern Aggression) – although it was not the reason the nation went to war. We read the letters and speeches of import from John Brown, Thoreau, Calhoun, Clay, Choate, Douglas and many more. We go to the Alamo and read the words of Travis, all the while knowing the outcome – we must read it anyway – one of the greatest stories of heroism this nation has ever known; 13 days of glory, so that time could be bought at a heavy price in order for Houston to do what he needed to do, in order to declare Texian Independence. We’ll also study study the Treaty of Guadalupe Hidalgo, the Gadsden Purchase, the Dred Scott decision and that of former President, John Quincy Adams before the Supreme Court arguing the rights of the captives aboard the ship, Amistad. We look at Lincoln, Jefferson Davis and Robert E. Lee, and learn of their stand on the issues, including state’s rights – a topic of great importance to this day. Are we freer today than our ancestors of 150 years ago? As you read through this volume and the rest of our series, you might discover otherwise. Once again, the lessons of the past are our road map to the future. Take heed.